How do flipped classrooms work? In a previous post, we wrote about a research-based strategy, Just-in-Time-Teaching, for motivating students to do the work of content coverage out of class. But, what happens in class? 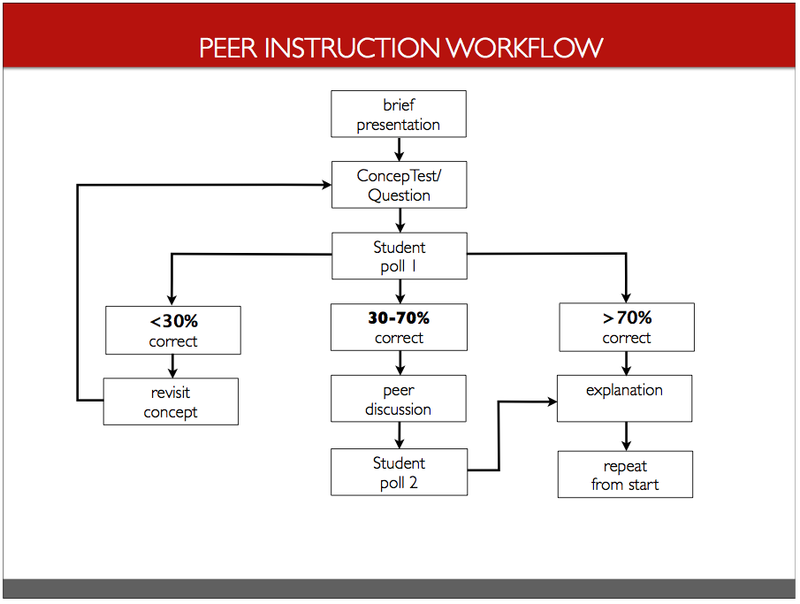 Peer Instruction (PI) is the researched-based method we use for targeting depth and uncovering misconceptions and misunderstandings during class. Peer Instruction Network member Bernado, who teaches Marketing in Mexico, asks, “how does PI work?” Mark, a high school chemistry teacher from Lexington wants to know: “How does one implement the process? How does one get honest feedback from students?” Sean, who teaches art in Oregon, also wonders: “What does actual class time look like?” And finally, Jonathan, who teaches math at the community college level in North Carolina, says: “What do you do with the students that understand the material from the video lecture? What classroom material do you need to challenge the “good” students?” We address these questions in Turn to Your Neighbor this week. Before each class period, we ask students to complete some kind of pre-class activity, that is distinct from homework. Typically, these activities include a reading or a video lecture to prepare for class. See the posts How do I Get My Students to Prepare Before coming to a Flipped Class? and How to Manage Time During a Flipped Class to learn more about how we do this. Pre-class readings and videos are organized around common course topics, just as they would be in a traditionally taught course. However, instead of simply picking readings or videos about general topics, we try to select activities that are tied to core ideas and/or concepts that will help students understand the subject. The distinction between these questions is slight but important, and posing them to yourself will help you begin to identify the differences between factual knowledge and understanding (see Understanding by Design for more on this). In response to Jonathan’s question, we consider the ability to transfer knowledge across contexts as the signpost of understanding, so we make sure to test for the ability to transfer knowledge with in-class questions. As part of their out-of-class work, students complete an online reading assignment. We take responses to these assignments, especially The Feedback Question, “What did you find most confusing about the reading or video?”, and look for trends in student misunderstanding and misconception around the core ideas or concepts covered in the pre-class exercise. So what does actual class time look like? First, it engages all students, good and developing, in the higher-order thinking activities that are the hallmark of expert learners, such as metacognition or thinking about what you know or don’t know. Second, it challenges students by engaging them in desirably difficult studying situations that cognitive scientists link with stronger memory and robust learning. Two examples of these study situations are spaced practice (learning core concepts in spaced time delays, at home and in class, versus learning straight through as in cramming the night before a test) and interleaved practice (learning core concepts in different scenarios, such as at home and in class). Third, it provides students and faculty with immediate feedback as to students’ current level of understanding. And to Mark’s question, this process encourages honest feedback from students because they can respond anonymously rather than in public. Immediate feedback provides opportunities for teachers and students to make informed and strategic decisions about what to do next, a skill what cognitive scientists like to call, self-regulated learning. Students, who are alerted to their level of understanding in the face of a question, can make more direct decisions about what to do with their learning. Maybe a wrong answer alerts the student to pay attention or to go back and re-study specific material. In addition, with immediate feedback from all students, versus just the few brave ones who raise their hands to ask questions, faculty can make more direct decisions about what to do with their teaching in and out of class. 1) If too few students get the answer correct after the first poll, we usually go back and revisit the topic or concept. 2) If more than 70%, get the right answer we usually go right to explanation, unless it is a concept or idea for which want 100% correct responses. 3) We aim to write questions that 30-70% of students answer correctly. If, after the second poll, we see a high frequency of responses across choices (say 60%A and 40%B), we usually solicit student volunteers to represent and explain why they selected they answer they did. We always close with an explanation of the best or correct answer, if there is one. 4) We repeat with each core idea or concept. Choreography of a flipped classroom | Flipping good | Scoop.it linked to this post. Choreography of a flipped classroom | 21C Teaching and Learning | Scoop.it linked to this post. We are trying to implement this in a Business School in India (www.dcsmat.ac.in) with students of average calibre (around 50 percentile in admission tests). There is scepticism that this will work only with bright students such as in Harvard. Some of us feel that it is appropriate for us as it will make students stand on their own through this process. Any empirical evidence or opinions on this? We are trying to implement Peer Learning in most of the subjects in our Business School in India (www.dcsmat.ac.in). We deal with average calibre students (around 50 percentiles in admission test). There is scepticism that Peer Learning will work only with bright students; hence Mazur’s success in Harvard, etc. Some of us feel this is better suited for the not so bright as they will also learn to stand on their own in the process. Would any of you have any empirical evidence or opinions on this? Have a look at the team-based learning literature : this is a format that definitely uses peer learning and actually started in the business world. From what I have read and experienced, it tends to support the lower performing students to a greater degree as it requires them to keep up with the work and utilizes the other students to explain the material in a different way if needed. I also think it is just plain more fun for the higher performing students so win-win.